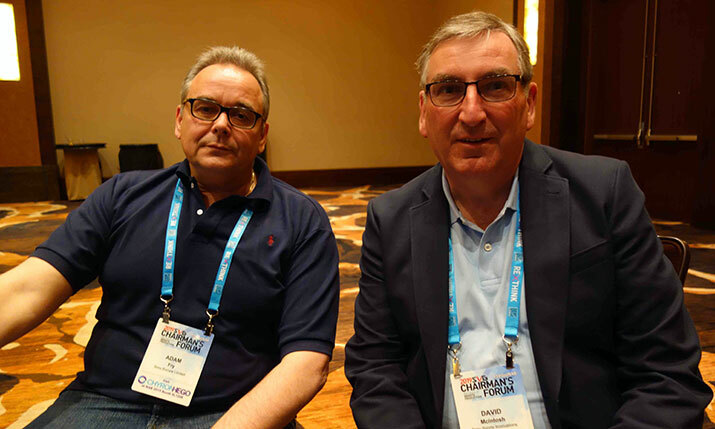 Sony Professional Solutions Europe recently upgraded its sponsorship of SVG Europe to Platinum, in order to cement its commitment to the sports broadcasting industry. The move follows the inauguration of a dedicated sports innovation division, and at the SVG Chairman’s Forum at Red Rock Casino on the eve of NAB we sat down with David McIntosh, senior vice president Sony Sports Innovations and Adam Fry, vice president Professional Solutions Europe to learn more about key changes in the European sports arena. David McIntosh: “You’re aware that, together with HBS we were heavily involved in producing coverage of the World Cup. You’re aware we own Hawkeye and Pulselive. We have pooled all of those businesses together into a new division called Sony Sports Innovations, focused on the sports production market worldwide. That’s the significant step we’ve taken. Adam Fry: “Sony Sports Innovations was set up around 18 months ago. Everyone knows our media production business and we’re all comfortable with that. In 2011 we acquired Hawkeye, and there’s a sister company there as well called Pulselive which works on managing digital assets and platforms for sports federations like the EPL. “Then in 2015, we realised the markets were starting to converge and also that the industry around sports media production is starting to change and mould itself differently. We looked at our own strategy again and realised we had a number of assets in the officiating side of sports – which is changing the way sport is played, engaged with and viewed – and then on online and digital with big changes in the Pulselive area as well. “We felt we should pull all those assets together and manage where we think the industry is going to go, and also how we think the differences in some of the commercial models may play out in the sports markets – such as content owners looking at different models for monetisation of their media.